This newly released image from the Cassini Spacecraft shows Saturn’s moons Tethys and Rhea. Similar in many ways, Saturn’s moons Tethys and Rhea (left and right, respectively) even share a discoverer: Giovanni Cassini, namesake of the NASA spacecraft that captured this view. The moons are named for sisters — two Titans of Greek mythology. Although somewhat different in size, Rhea (949 miles or 1,527 kilometers across) and Tethys (660 miles or 1,062 kilometers across) are medium-sized moons that are large enough to have pulled themselves into round shapes. They are both composed largely of ices and are generally thought to be geologically inactive today. The view looks toward the anti-Saturn sides of Tethys and Rhea. North on both moons is up. The image was taken in visible red light with the Cassini spacecraft narrow-angle camera on Oct. 11, 2015. The two moons appear close together here, but Tethys was about 220,000 miles (360,000 kilometers) farther away from Cassini when the image was captured — nearly the distance from Earth to our moon. Thus, the view does not accurately reflect the bodies’ relative sizes. The image was obtained at a distance of approximately 708,000 miles (1.14 million kilometers) from Rhea. Image scale on Rhea is 4 miles (7 kilometers) per pixel. Tethys was 930,000 miles (1.5 million kilometers) away during this observation and has a pixel scale of 6 miles (9 kilometers) per pixel. 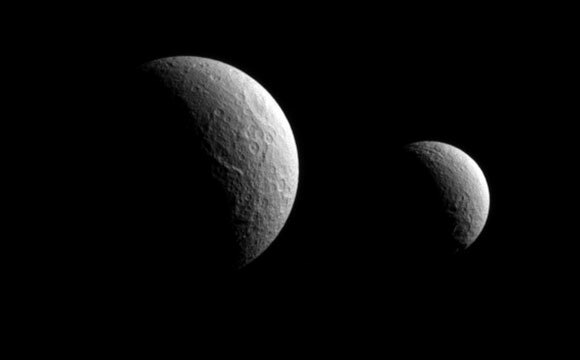 Be the first to comment on "The Saturnian Sisters – Cassini Views Tethys and Rhea"